226 pages, 8.5" x 11"
It had taken three and a half decades, but the Detroit Tigers were finally crowned the best team in baseball in 1935. Coming on the heels of their hugely disappointing loss in the World Series to the St. Louis Cardinals the year before, the Tigers emerged victorious in a thrilling six-game October showdown against a talented Chicago Cubs team. It was Detroit's first World Series championship. For a city suffering from the Great Depression, it couldn't have come at a better time. The team was led by player-manager Mickey Cochrane, and featured an offense fueled by Hank Greenberg, Charlie Gehringer, and Goose Goslin (dubbed the "G-Men"). On the mound were Lynwood Thomas "Schoolboy" Rowe, Tommy Bridges, Elden Auker, and General Crowder. With 93 victories that summer, the Tigers outpaced the New York Yankees by three games, taking their fifth American League title in club history. To commemorate the 80th anniversary of this great team, the Society for American Baseball Research is proud to present the 1935 Detroit Tigers in all their glory. With contributions from over 35 members of the SABR BioProject, this book is a delightful account of one of the most significant teams in sports history. E-book: Click here to download the e-book version of Detroit the Unconquerable: The 1935 World Champion Tigers for FREE from the SABR Store. Available in PDF, Kindle/MOBI and EPUB formats. Paperback: Get a 50% discount on Detroit the Unconquerable: The 1935 World Champion Tigers paperback edition from the SABR Store ($15.99 includes shipping/tax). 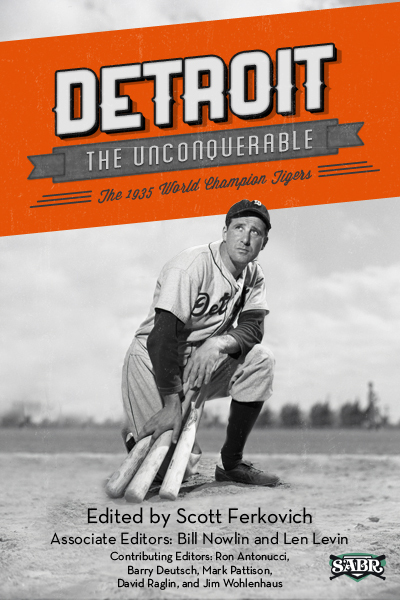 E-book: Click here to purchase the e-book version of Detroit the Unconquerable: The 1935 World Champion Tigers for $6.99 from the SABR Store. Available in PDF, Kindle/MOBI and EPUB formats. Paperback: Get the paperback edition of Detroit the Unconquerable: The 1935 World Champion Tigers from the SABR Store ($30.99 includes shipping/tax). This page was last updated October 31, 2017 at 7:40 pm MST.